Glad there seems to be a consensus on the jersey. internally there was dissent? that's good - at least they dont think its great. i hope we have a good year and build to something and sort this problem out before next year, although yearly jersey changes are one of my pet peeves, but we just need to change this thing asap. the blue with yellow chevron from the Albert Kelly year ( 2014 ish ), or last years version of our 2007 jersey are my personal favourites, but the ocean blue must be dominant again. Mal was a massive signing. A mate of mine told me about him coming onboard when the news first broke. I was sure he was having me on! After reading it for myself I was over the moon!! Hey! Did you notice how I misspelt reins earlier. LOL!!! It certainly was an announcement of epic proportions. I'd love to see and we desperately need him to stick around the club long term. So I hope everyone makes him feel valued, comfortable and very welcome. We are in a position where he can have an enormous impact on our culture and legacy. There will be plenty of praise to be handed around at the end of the year! Mal Meninga could soon become one of the biggest powerbrokers in rugby league after being approached about becoming the inaugural chairman of the game’s coaches’ association. Meninga, already the coach of the Kangaroos and the head of performance and culture at the Gold Coast Titans, has been approached about the new role just months after he became the latest league Immortal. The Rugby League Coaches’ Association is expected to be officially formed before the season kicks off in mid-March, giving the clipboard holders a unified voice for the first time. The NRL is fully supportive of the association and is even prepared to offer the funding required to kickstart the initiative. Meninga is viewed as the ideal person to chair the first board, a statesman with playing and coaching experience at club, state and international level. The 58-year-old is already one of the most influential men in rugby league and the new role would allow him to mould the 16 head coaches into a collective force. Roosters coach Trent Robinson and former Raiders, Cowboys and Titans mentor Neil Henry are among the other current or former NRL coaches that have been earmarked for board spots. "We’re looking at getting a high-powered board together so it has credibility straight away," Henry said. The need for a union was highlighted late last year when a plethora of coaches were either sacked or traded, despite the fact almost all of them were still under contract. Penrith axed Anthony Griffin with more than two years to run on his contract, sparking a chain reaction that ultimately resulted in Ivan Cleary rejoining Penrith, Michael Maguire replacing Cleary at Wests Tigers, Anthony Seibold and Wayne Bennett trading places at South Sydney and Brisbane and Des Hasler replacing the still-contracted Trent Barrett at Manly. Further, John Morris was elevated to head coach at Cronulla after Shane Flanagan was suspended. The instability is expected to continue this year, with the contracts of Brad Arthur, Paul McGregor and Dean Pay expiring at the end of the season. Henry has been one of the driving forces of the RLCA, which is in the process of finalising its constitution and becoming officially registered as a company with the assistance of lawyer and former footballer Tim Fuller. Henry said amending the rules about when coaches can be approached and poached would likely be one of the first big issues for the union to tackle. "We’d all agree it wasn’t good for the fans, it wasn’t good for the clubs," Henry said of the coach-swapping of last year. "Everyone wants a bit of clarity around what are the rules regarding when clubs can approach coaches who are contracted. That needs to be looked at, there’s no doubt that needs to be clarified. You also have to look at whether the services of assistant coaches will retained for the following year. "That would be one of the first things we could tick off on, I’m sure the coaches won’t have a problem with it." A potential solution is to bring coaches in line with players, who can’t be approached until they are in the final year of their contract. Other issues likely to be debated include the setting of a minimum wage for assistant coaches and following the lead of the AFL, which requires clubs to make a call on whether they re-sign an off-contract coach 12 weeks before the end of the season. The intention is to also offer coaches, particularly those who have been sacked, with independent legal advice and career-transition opportunities. "One of the key objectives of the association is to provide a unified and collective voice," Henry said. That’s what you do when you’re out of work, you create a job ... onya Neil Henry. The Gold Coast-NSW Northern Rivers area is necessary for rugby league. It is a vital corridor for our sport. An NRL club needs to play out of this region because it's such a strong rugby league fraternity and boasts a proud history. The AFL is pushing hard in this area and soccer's popularity continues to rise. It hasn't worked here before but the Titans are hell-bent on making sure it works this time. How do we achieve that? Basically we first have to make the club a sustainable success. You do that by providing better development programs and doing really good community work. That has already started - the players' work in the community has been exceptional, the best in the competition I'd hazard a guess. So strong efforts in these two key areas are vital. The Titans want to become known as a strong development club on the back of that strong community spirit. History tells that a lot of successful and well-known players come out of this region. And it goes way back to 1914 with Frank Burke – yes, the man who had the western grandstand at the old Lang Park named after him in 1962 – moving a motion to introduce rugby league into the Tweed River region. It passed and the handful of rugby union clubs became rugby league clubs. So he was instrumental in getting rugby league established here on the Gold Coast-Tweed area. Burke sat on the Tweed Heads Seagulls board and later became president of the QRL. In the 1950s the Tweed Heads Seagulls signed Barry Muir as player. He went on to play 22 Tests for Australia and after he finished, he ended up coaching the Queensland team (1974-78). From all that became a multitude of success for teams and players out of this area in regional, national and even international arenas. The French and New Zealand teams played tour matches here. In the 1930s the Chinderah All Blacks was one of the Tweed regional teams that used to tour regularly down south playing the St George Dragons for about 10 years – and from that concept the Redfern All Blacks rugby league club was formed in 1944 as a result of those visits. A lot of the people involved in the clubs throughout the NSW northern rivers and Gold Coast areas played rugby league in winter and were surf life saving officials and competitors in summer. Immediately the community bond was formed and that is what the Titans are forging ahead with now. I haven't got the exact figures of how many players from the region – Grafton, north to Lismore, Casino, Murwillumbah, Tweed Heads and the Gold Coast - are playing at other NRL clubs but it would be quite a few. I don't have the precise reasons why elite first grade teams haven't succeeded here in the past – the Tweed Heads Giants, reverting back to the Tweed Heads Seagulls, the Gold Coast Chargers – although the Seagulls have had great success in lower grades and competitions and are the Intrust Super Cup feeder club for the NRL Titans, formed in 2007. It is because of the passionate and hard-working people here that I agreed in November last year to become head of performance and culture at the Titans. Hopefully what I can bring, alongside the others, is a feeling of self-belief in knowing who we are and who we represent. We want to be unique, a bit different, not necessarily follow other clubs and what they've done. We intend to blaze a trail moving forward. The owners here – Darryl Kelly and Rebecca Frizelle – are really good people and have made big investments in this club. 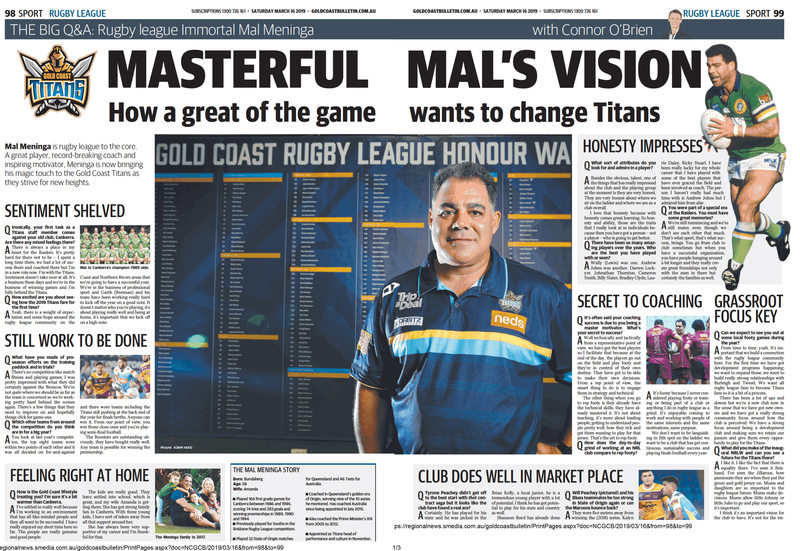 They believe the Gold Coast community deserves the Titans, who can then give back to the community. The desire is here, despite the fact three NRL finals appearances in 13 years isn't a glowing endorsement to support us. But to have strong beliefs, to have a resilient development plan, to be proud of our community work, getting it right in the front office and results on the field, who knows what can happen. One of the most important signings in our history. Big Mal is shaping as THE missing piece to the Gold Coast league puzzle. Mal Meninga reckons unless you know where you come from you don’t really know where you’re going. So he is quietly taking the Gold Coast Titans on a journey of discovery back to their deceptively deep and colourful roots. Meninga, who has joined the Titans as head of performance and culture, has arranged for the erection of a dressing room honour board which carries the name of every Gold Coast player who has passed through the four incarnations of local teams (the Giants, Chargers, Seagulls and Titans) to be part of the national competition in the past 31 years. Digging even deeper, he asked former Courier-Mail league journalist Steve Ricketts to trace the heritage of Gold Coast rugby league in a special research document. Being a proud Murwillumbah export Ricketts attacked the task with typically forensic gusto. His findings shine on a light on often neglected facts about the regions rugby league heritage such as the fact the code was so strong in the Tweed Heads region in the 1920s that a local team took on Queensland and NSW. Meninga hopes to create a Gold Coast Hall of fame and the club’s history committee has also launched a public appeal for any items locals feel could be placed in it. The end result of the whole uplifting exercise is that will help to give the club the one thing it has truly craved yet somehow never quite attained ... a soul. The region famed for having a “here today, gone tomorrow’’ vibe can now guarantee players that if you were here today - or yesterday - you will, in a small way, be here forever. “It’s important not just for Gold Coast people but people in general to know the Gold Coast is not just there to make up the numbers,’’ Meninga said. “It is a strong nursery and has been for a 100 odd years. We have the honour board which recognises players from 1988 but I would like to have a Hall of Fame to recognise people who went beyond that who helped to set up the Gold Coast rugby league. “It’s important we acknowledge that rugby league in the Gold Coast and Northern Rivers was a lot older than when the Giants first started in 1988. “That’s my pitch. Steve Rickett’s work shows us there has been a lot of success before then. Senator Ron McAuliffe started his career down here. Lionel Morgan was the first indigenous rugby league player to play for his country and he came from the Gold Coast. The great Barry Muir came from the Tweed. He is instrumental in generating the passion for Queensland rugby league. Meninga’s retro drive is not window dressing for he has always been fascinated by the history of the game. Two years ago he started a push for all BRL games played in the pre-Broncos era to count on a players record. He has kept more than 30 jerseys from his playing career and, in an episode of Fox Sports Queenslanders Only, proudly displayed an old Brisbane Souths jersey which used to have Colonel Sanders face on the front of it but had faded into a red mist. Lots of things happen in life that we later forget. One time that has stuck was an early (perhaps debut) game of Mal's for Souths at Davies Park. It must have been against Wests. I remember it because he must have been talked up in the press as the next superstar. I went overseas and when I returned his playing career was over. What a miss. Having a sense of the past is so important. The passion of State of Origin has no meaning unless we remember the days when a bunch of Queensland semi professionals and amateurs would get smashed by returning Queenslanders in NSW jerseys. Mal remembered and stuck it to NSW when he could. Last edited by Titanic Believer; 09-03-19 at 09:59 PM. Having a sense of the past is so important. The passion of State of Origin has no meaning unless we remember the days when a bunch of Queensland semi professionals and amateurs would get smashed by returning Queenslanders in NSW jerseys. Mal remembered and stuck it to NSW when he could. This is one of the biggest truths you will ever read on this forum. As a massive fan of the BRL I have to agree. But I came in at the very end of the BRL era. I missed the golden era. I only managed to learn about it through the preservation of history through books, word of mouth and fellow leaguies who lived it. For those who can remember Lang Park bursting at seams week in week out and the club grounds similarly in the late 60’s and early 70’s or the Amco and Panasonic eras later on and even the Simply the Best period will understand how far we’ve come and what history means. I just merged a few Mal threads into one. A big thread for Big Mal.